Craftster Community > PAPER CRAFTS, SCRAPBOOKING & ATCs (ARTIST TRADING CARDS) (Moderators: Phizzychick, rackycoo, cackle) > PAPER GOES 3D: 3 fun projects bringing paper from flat to fab! PAPER GOES 3D: 3 fun projects bringing paper from flat to fab! Sometimes it's fun to take a flat piece of paper and make a 3D object. Use these great tutorials to bring your paper to life, in a three dimensional way! 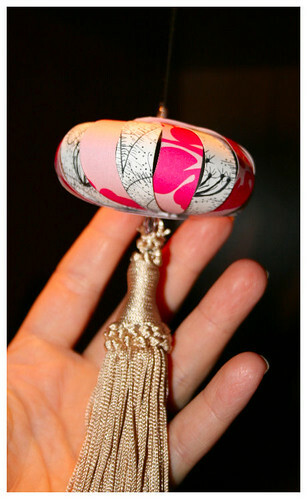 This paper lantern by HSG makes for a fun tassel topper! 85%confusion made adorable ornaments out of scrapbook paper. Whoa, these stars each took 30 pieces of paper to make, but they're gorgeous! Thanks to aml for writing up a tutorial. Anytime you have paper and need inspiration, be sure to access the list of Craftster papercraft tutorials here. Get inspired! Re: PAPER GOES 3D: 3 fun projects bringing paper from flat to fab! Hard to believe that all of those were made from paper! All lovely and shows the versatility of paper...hmmm...off to get some more inspiration! These are all such great projects to revisit. I'm almost ready for Xmas in July, just getting some crafting ideas started in my mind. Using cards from last year is such a nice idea.